There is this thing going around FB where people are listing their top 10 books. I refuse to not be a part of any fad. And thus, here is my list (in no particular order). 1. The Godfather. By Mario Puzo. As someone said, it is the dictionary of crime. It was the first time when I thought reading books could be fun. I loved reading it. I love love it. The characters have stayed with me for years. I can still recall the plots. I know the dialogues by heart and so on and so forth. If there is one book that you ought to read before you die, its this one. Or may be its English, August. 2. 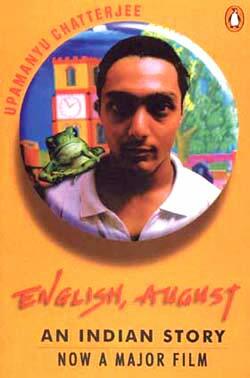 English, August. By Upamanyu Chatterjee. Its like my biography. Just that Ogu is little less lost, far more focused and younger than I. I can totally relate to everything that Ogu did while he was posted in Madna. I’ve went through every emotion that August lived through while he wrote the book. If there is one book that I wish I had written, it would be this. Here is a post I wrote about English, August. 3. The Count of Monte Cristo. By Alexandre Dumas. Its a work of pure genius. Its revenge. Served cold. 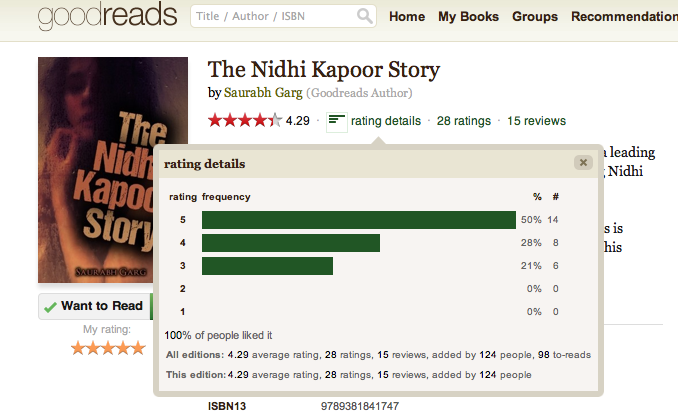 This is what inspired me to work on The Nidhi Kapoor Story. If there was no Monte Cristo, there wouldn’t be any Nidhi Kapoor. I wrote about the strange dreams that I started having when I read the The Count. 4. Rich Dad. Poor Dad. By Robert Kiyosaki. Yes. Self-help. And yes, I am aware of all the controversy and debate around it. But, eat my shorts, as Bart would say. I read this recently and since then it has changed the way I look at things. I wish I had read this one sooner. May be just before I entered the business school. 5. Eat, Pray, Love. By Elizabeth Gilbert. Because I am as depressed as Groceries is. And her travel helped me get over some bit of my depression. I am serious. Just that I dont know if its a true story or a fictional one. I did goto Bali this year and vaguely tried to search for Ketut but could not find him. 6. On Writing. Stephan King. Of course. I don’t have to say anything anymore. It has inspired www.onWriting.in. 7. To Kill a Mockingbird. By Harper Lee. I instantly fell in love with Scout. I wish I had a girlfriend like her! Too bad Harper Lee wrote just one book. As an aspiring writer and a voracious reader, I see a good bit and a bad bit. Good, that she has made enough money from one that she does not have to rely on the mercy of readers / reviewers for sales of the next ones. Bad, that as a reader, I couldnt read more from her. 8. Jack Reacher (series) by Lee Child. This is what unadulterated, indulgence is. You are so enthralled by the man, Jack Reacher, that you dont want his fables to ever come to an end. I have read 13 / 14 books and when I realized that I had read almost all his books, I did not want it to come to an end. And I cant wait for the next one to come. Whenever it does. Someday, I aspire to write about a man like him. Or may be a woman. 9. Shantaram. By Gregory Davids Roberts. I did not like the way it ended but the way he has romanced Mumbai with his “brother” on bikes, uff! They must’ve been one hell of a time. If there is someone who has been able to do justice to Mumbai and its charm, its Shantaram. Read this one purely for his narration on Mumbai. And infectious smile of one Prabhakar. 10. The Mahabharata. By I dont know who. Surprise surprise. Not a modern fiction but a story none the less. I must have read this one a thousand times. Excluding the Geeta bits. The book is about righteousness, fairness, fair play, good, bad, evil, life, revenge, greed, love, jealousy and all such passions that a human being is capable of experiencing. Love the complex plots and epic connections and relationships. While writing, the notes would have ran into millions of pages. I know I’d never be able to, but I would give an arm and a leg to peek into the notes. Any ideas how? And here is a bonus. 11. Warren Buffet letters. Again, technically not a book but it’s a collection of annual letters he writes to shareholders of Berkshire. Love his sense of humor, his candour and the simplicity with which he writes. He doles about advice on life and investing in the garb of these letters. Its one of those things I wish I had read sooner. Thanks Internet for this meme. Thanks Radhika for the prompt. What is your list of 10 books that have stayed with you over the years? P.S. : Too lazy to include links to these books. Easy enough to find I guess, if you want to read them.